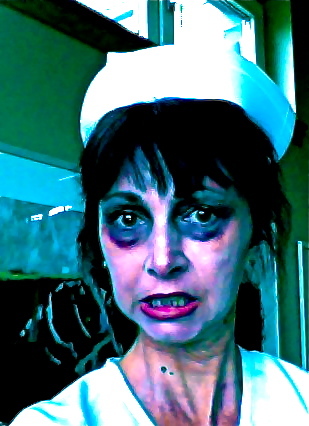 This Ghoul Will be Your Nurse Tonight: Should Nurses Wear Halloween Costumes to Work? I dodged a bullet this week. My coworkers are wearing costumes to work on Halloween. I was scheduled to work that day, but on Friday a nurse asked to trade shifts, so I don’t have to decide whether or not to wear a costume. This year I won’t feel like the spoilsport among my coworkers. Don’t get me wrong, I like Halloween, costumes, jack o’lanterns, and all that. I just wonder if they are appropriate in patient care areas? Nurses wearing costumes to work on Halloween aren’t limited to my unit. The entire hospital celebrates with costume contests (individual and department categories), decorations, and special treats. It’s intended to build enthusiasm and rapport among employees. There are written guidelines about what sort of costumes and decorations are not appropriate. Respect for gender, race, political, and religious beliefs is emphasized. Costumes and decorations cannot be gory or represent death. They cannot interfere with patient care either. For many reasons, the celebration of Halloween at school can lead to student exclusion. There are social, financial and cultural differences among our families that we must respect. The spirit of equity has led most PPS (Portland Public Schools) schools, including most elementary schools, to deemphasize the celebration of Halloween at school. He has a point. Critics argue that banning Halloween costumes from schools is taking political correctness too far. But what about hospitals and nurses? Halloween costumes are allowed in every hospital I’ve worked for, however, I never wore one to work. In the PICU, there were so many painful situations that, for me, costumes felt out of place, yet I don’t recall a single patient or parent expressing disapproval of nurses dressed as witches or scarecrows. Now that I am an outpatient adult oncology nurse, I still don’t wear costumes to work. I have not heard complaints from our patients about the nurses who do. What do other nurses and health care providers think about this? I also wonder what patients and people from other walks of life have to say. This entry was posted in Holiday Posts, Posts About Art & Nursing and tagged Costume, Halloween, Huffington Post, nurse blogs, nurses, Opinions, patient care by jparadisirn. Bookmark the permalink. I’ve scheduled a post about this tomorrow morning…had to link to you when I saw yours! Great post! It’s particularly timely as my recent post on AJN’s blog about holidays didn’t mention a particular Halloweeen… but I certainly had an experience that is related to this discussion. I wore a clown costume to work one year. We had a kiddo that came into us from the Oncology Clinic for the full leukemia work up. It was a horrific day for him and for us… his family told me later that he ended up with quite a “clown aversion” after the experience and so did I!!! No more costumes for me in the future… unless it’s something quite benign, like a hat or jewelry. Thanks for posting!